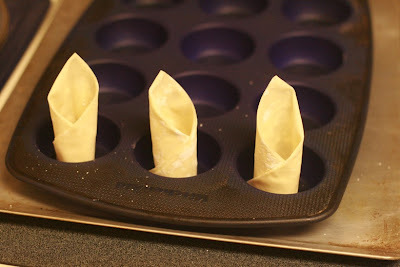 1) Thaw the spring roll wrappers in advance (they usually come frozen), and then open the package and peel off two at a time. 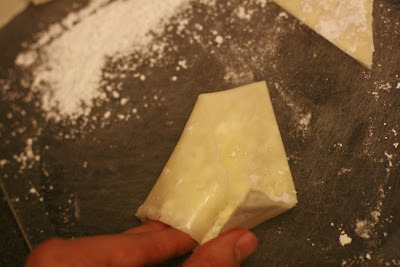 2) Butter each wrapper very thinly, then shake on some powdered sugar. 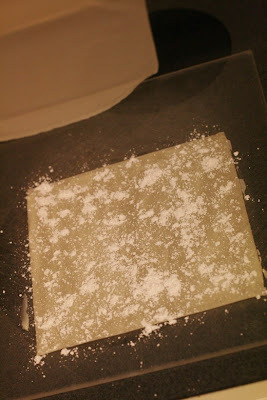 3) Shake off excess powdered sugar. 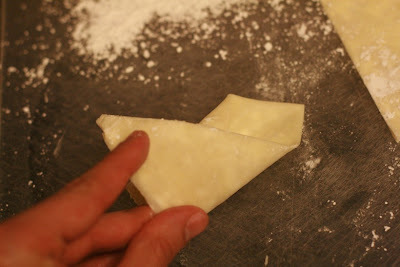 4) Fold wrapper in half diagonally. 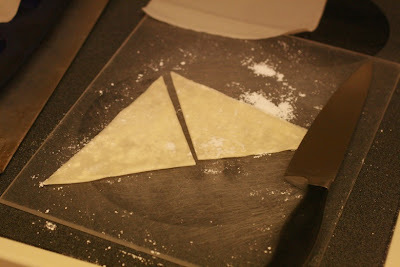 5) Cut in two to make triangles like so. Essentially, you want the top of the rightmost corner and the bottom of the leftmost corner to be buttered well enough that it sticks together and hold its shape. 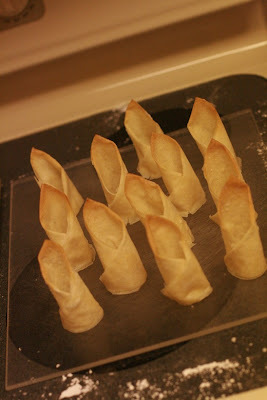 Note that you will want to work quickly on these (and never have more than two wrappers out of the package at a time) so the wraps don't become too dry and crackly. 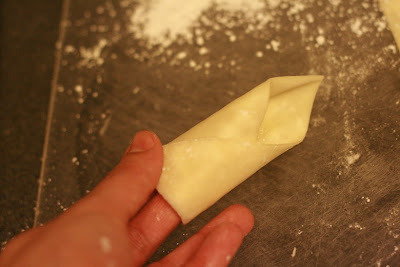 Slightly stiff but still pliable is the best for forming the tubes, and then they can get a little dry as they sit in the pan. 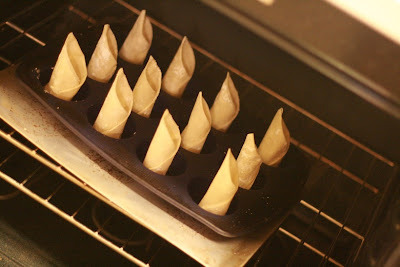 7) You saw this coming: place in a cupcake pan like so as you finish with them and let them set up. I use a cupcake pan because quite a bit of butter drains off each wrap and you don't want it to drip off of a flat cookie sheet. 8) Bake completed wraps (after even the last ones have been able to dry somewhat) in your oven at 350 degrees for 6-8 minutes. They're done when the tops are browned but not burnt. Note that you will probably lose one or two to collapse, which will not be good for presentation but is still tasty to eat. 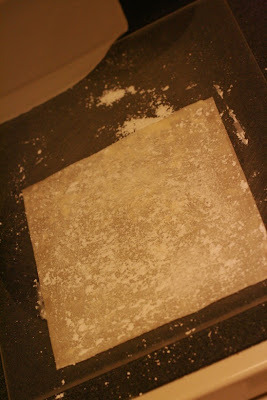 9) Let dry completely. 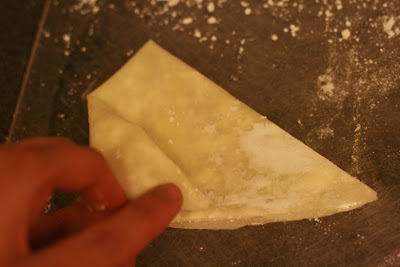 Depending on whether you overbuttered (try to push back into tube shape while they're still moist using spoon and knife) or if the wrappers got too dry (trim the bottom off with scissors), you might be able to rescue any deformities. 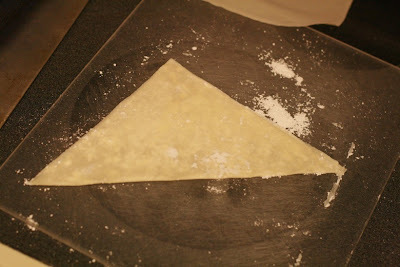 Note that the cookies will stay crunchy and edible for 3-4 days if kept loosely wrapped in paper towels in a cardboard box (no plastics), so you can make them in advance for a party. 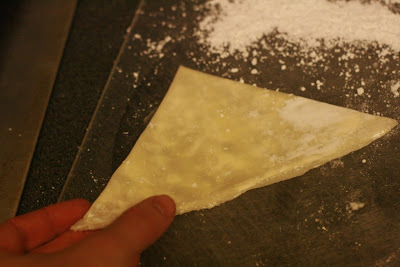 10) Just before serving, spoon or spray your whipped cream into the center. Yum! depending on your mood or the season! Corin stalked us this morning with the Jaws theme music — duh-nump, duh-nump, duh-nump — while holding up his pirate sword in the center of his face as a fin. Corin picked, out of a lineup of potential careers, playing "peaceball." The U.N. should be so lucky as to sign him. I hereby apologize to all employees for having left your store in more disarray than when I entered it. Whether it was a basket full of books and toys just left in the aisle during a cuticle emergency, a Barbie fishing pole tucked by the skateboards that belonged halfway across the store, or a collection of cheeses stacked high in no particular order, I have failed to curb Corin's enthusiasm for indiscriminate shopping, hoarding, and crafting of his environment. 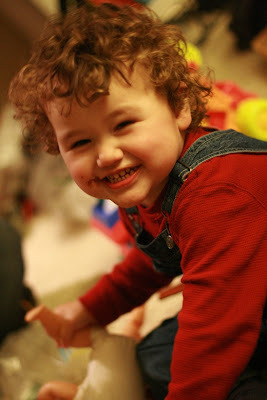 Sure, I start out well enough, sliding the box of pasta back into its place as he scampers back into the fire-truck-themed cart-cab, or racking Matchbox cars back on the pegs as he moves on to a light-up phone, or tossing the bag of pastel M&Ms just back into the toddler-sized plastic M&M-character display. But at some point he always gets the upper hand, like a tossing a flaming baton to a juggler when he's still getting the rhythm of the bowling pins. There's gonna be carnage. I'm just sorry to have to pick up the pieces. 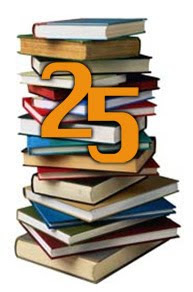 25 books: a reading challenge! So, I lost track of how many books I've read over the past year (thanks in part to the Patriot Act, which requires libraries to make their check-out records available for perusal by the feds, to which libraries responded by not keeping any records of an item checked out after it's returned), but I think it was something like 15, maybe 20. Recently, though, my to-read list (which is hundreds of books long, and which I'm sure I'll never finish) has ten books at the top which I consider very urgent. I need to pick up the pace. And it's not impossible to do. I easily read a book's worth of words on the internet every week or two, often on very transient and inconsequential topics, just killing time. 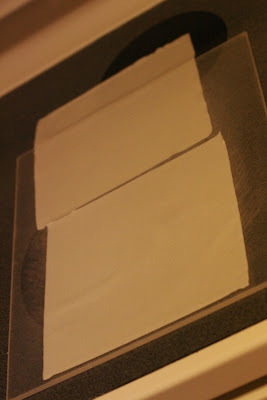 The laptop is just so useful, so ever-present, that it's like attention flypaper. Once I'm on it, it's hard to tear myself away. So I'm giving myself a challenge: 25 books by my birthday. That's 6 1/2 months away, giving me an average of a book a week with three extra weeks for leeway. Can I do it? I'll keep a running tally of books finished over in the sidebar to help give me incentive to keep up. I wanted to buy some gummy bears the other day, but since Corin's gummy vitamins are shaped like bears and we make sure he only eats "two a day," I didn't want him to see me eating a bunch at a time. 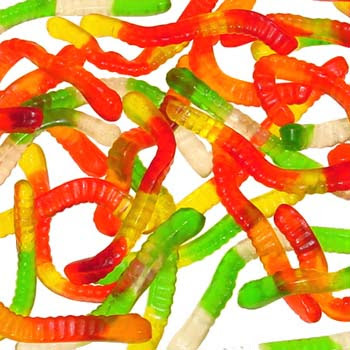 So I bought gummy worms instead. Corin wanted to try them out, but his teeth were having trouble getting all the way through, as they were slightly tougher than his vitamins. So I started biting one into small pieces for him, and I suddenly realized that I was chewing up worms to feed to my baby. 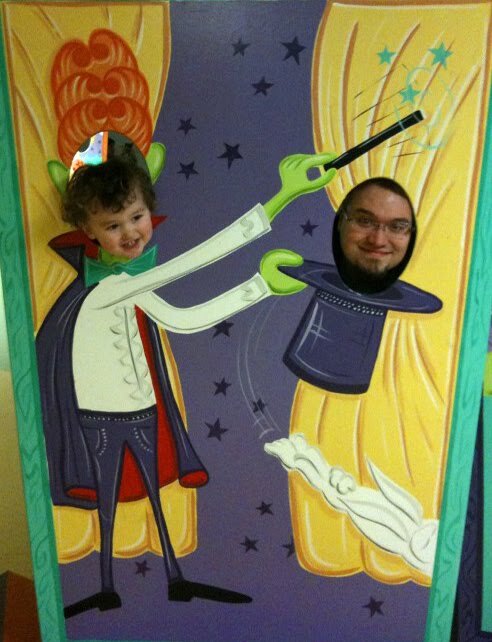 How much more classically parental can you get? CAPS FOR SALE! 50 CENTS A CAP!!!! I hadn't really known where my Lenten music discipline would lead me. I was thinking about it in terms of making it through the 40 days, not necessarily how it related to Easter itself. But in reading a snippet from N.T. Wright's "Surprised by Hope" the other day, in which he called for our Easter celebrations to be not merely a high holy day but a "hats in the air" day, with "champagne for breakfast" and exuberant festivities — and that our joyousness at life be reflected not in just one day a year but that we live as Easter people — it became clear that Easter would be a celebration of music. 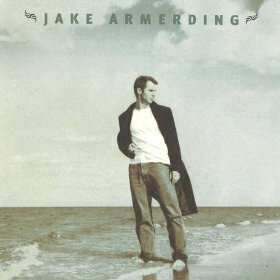 All the music which I had culled through — some joyous, some tired, some dissonant, some incisive (it actually turned out to be more of a chore at times than I was expecting) — felt a lot like tilling the earth. It was seeking and sorting, clawing and straining for glimpses of silver beauty. At the end of it, it became clear that I wanted to celebrate Easter with a rememberance playlist and hold forth the best of what I'd found in a shout of alleluia. 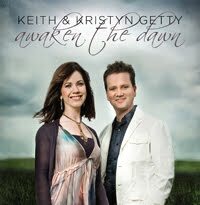 The two albums I kept returning to were Keith & Kristyn Getty's "Awaken the Dawn," which I'd purchased for Christmas but hadn't yet acquainted myself with, and the Newsboys' "Adoration" album. Those two more than others were the soundtrack of the last few weeks, as I'd usually turn to one of them after listening to an album that didn't really strike me. Rich Mullins was another prominent feature of the season (in part because his "Songs" album is the only tape I have in the car, and I still have a tape player) but also because his "Jesus Record" is amazing. A few new surprises were: Late Tuesday, in particular their song "Drowning Out Love," finding myself more drawn in by Jake Armerding ("Adonai," "Rome"), and finally being intrigued enough by an unnamed song that had been hanging around in my iTunes for four years to look it up and get introduced to Barlowgirl (and snagged a free new song of theirs from Amazon). Most fun was receiving new music, and music recommendations, from friends, as well as revisiting the last four years' worth of community-group music-sharing nights. I tend to spin my wheels in a music rut when left to my own devices (and I revisited a lot of older favorites of mine that no longer struck a chord with me), so thank you to everyone who helped me shake free.